This is a very easy spell to open your third eye. This spell is very helpful in helping in the activation of the third eye chakra. Your third eye chakra is very helpful in recognizing you mind’s power. The third eye is technically the 6th chakra. By using this spell you will find yourself becoming more open to receiving the thoughts, emotions and intentions of others. The third eye is locate just above the eyebrows in the middle. This is the chakra that is associated with clairvoyance, out of body experiences, the ability to see the auras of others, visualization and precognition. After during a simple purification bath, take the time to light the lavender candle and incense. Place them on your altar if you have one. If you do not have an altar then try to place them on a safe area where the life of the full moon beaming down on the items. Take the amethyst stone and place it in your right hand. Using you left hand – go in a circular clockwise motion over your right hand. 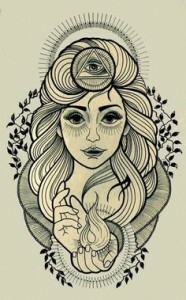 Chant the following: “Open my third eye, Goddess bless me with your sight.” Say this as many times as your want until you feel the energy at its peak in your hand and body. Place the crystal under your pillow and do a guided mediation to enter sleep, lucid dream, have an obe or astral exploration. The spell to open your third eye is complete. You can do this spell every 28 days until you see significant improvement in your psychic ability. Carry the stone with you daily and be sure to keep a journal! If this is your first time doing a spell like this then you may notice an increase in ‘Deja Vu’ or dreams at night that happen during the day. As you continue down this path these feelings will intensify and will become more and more frequent.